So I started this week expecting to maybe get one or two books from my various subscriptions, and maybe buy myself a little something. 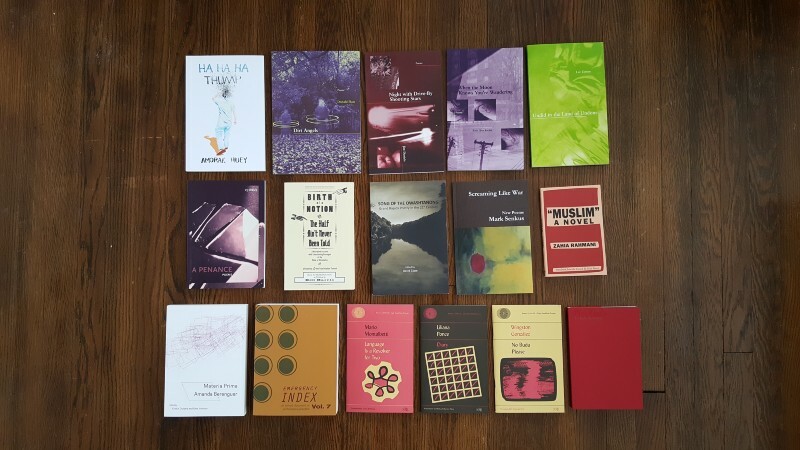 This in fact happened – the right-most book in the second row of the above photo (“Muslim”: A Novel) is the latest from Deep Vellum Publishing. Just to its left is Screaming Like War from Sault Ste. Marie poet Mark Senkus, which I picked up over the weekend while in the Upper Peninsula visiting my girlfriend’s family. All the rest of these books appeared unexpectedly. The bottom row consists of the contents of the new shipment from Ugly Duckling Presse. 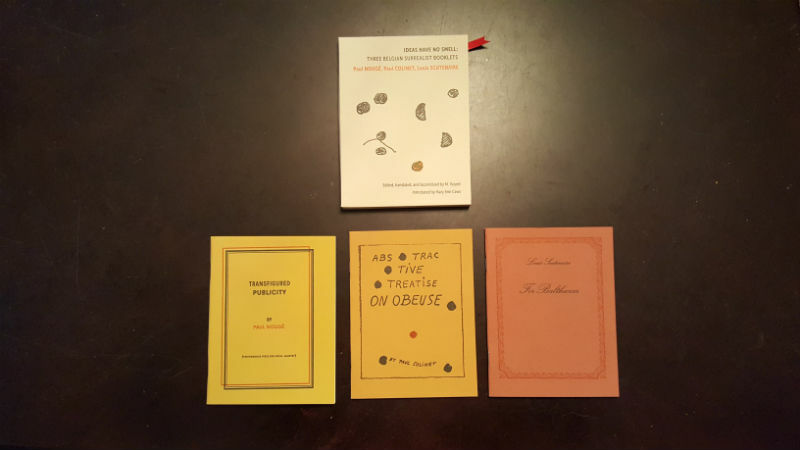 Four books of poetry, one of experimental prose, and Emergency INDEX, which is a listing of well over 100 performance art works in calendar year 2018. It’s all brilliant stuff, and I wish I had a couple of years free so I could bury myself in the beauty therein. The top row, and the first three titles in the second row, are books of poetry which I unexpectedly acquired when I attended the Evening of Literary Luminescence, a fundraiser for local literary organization Write616. Not surprisingly, almost all of the poetry is by local and regional writers, so extra bonus there. Last week I finished Scarborough and, needing something lighter, read Kelly Link‘s wonderful Origin Stories, which is a hardcover chapbook published by Subterranean Press. Currently I am over halfway through A People’s Future of the United States. It is, simply, an amazing collection of stories. They follow the theme of the possibility of hope standing against the logical outcome of the current (reactionary right-wing, racist, bigoted, sadistic, misogynistic, jingoist, xenophobic, capital-fetishizing, violence-loving, neo-fascist, Dominionist) political and social climate. The stories are beautiful, sad, infuriating, hopeful, astonishing, intelligent and above all necessary. Every imagined dystopian future in this book is easily extrapolated from the actions of the current dominant power structures. And each of these futures must be recognized and resisted. In other literary news, I am almost done re-integrating at Caffeinated Press and am at various stages in four projects: Issues 4.1, 5.1 and 5.2 of The 3288 Review, and layout work for the next edition of our Brewed Awakenings anthology. Other things are afoot as well, which will be revealed in the fullness of time. Selah! Only one new acquisition for the first full week of November, but that one thing was actually three things – three chapbooks, to be precise, from Ugly Duckling Presse. The collection (the box for which is at the top of the photo) is called Ideas Have No Smell: Three Belgian Surrealist Booklets. The three are Transfigured Publicity by Paul Nougé, Abstractive Treatise on Obeuse by Paul Colinet, and For Balthazar by Louis Scutenaire. I have to say, in the brief time that I have held a subscription to Ugly Duckling Presse they have been absolutely knocking it out of the park.